Two homes, one site built 1928 sq ft, and one mobile with add on - 1920 sq ft. Site built home has had some recent upgrades, new windows and siding, it has a bedroom, living room, game room/family rm, bathroom and kitchen/dining rm on the ground floor, upstairs is a large loft room, w/Murphy bed and bathroom, it has lots of character with a wood burning stove and a sandstone fireplace. The second home has 3 beds, 2 baths, family room and living room with a wood burning stove, a large eat-in kitchen and wraparound decks. There are 2 horse barns, and a utility building. There is also a well built sweat lodge. 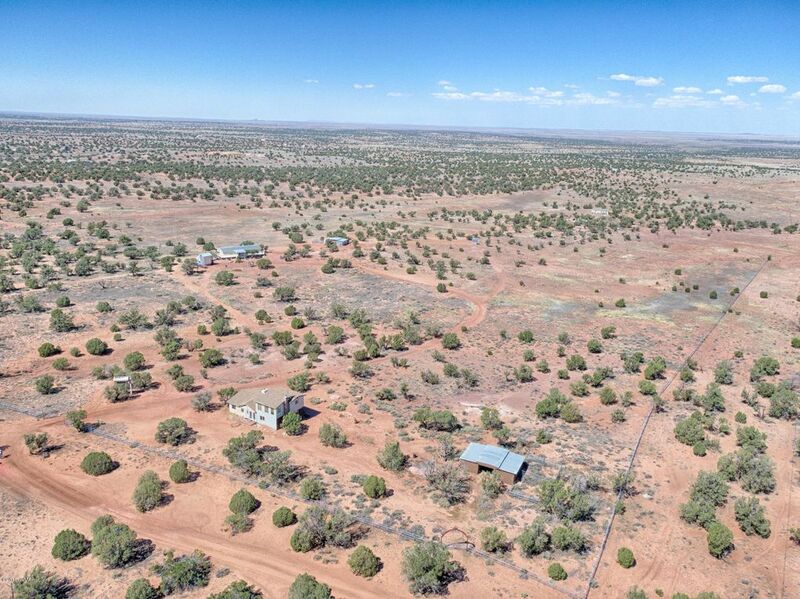 The property is fully fenced with pipe fencing, both homes share the well and solar. They are on 2 separate parcels. Owner may carry with large down payment. Directions: From Snowflake, East on the Concho H'way to Old Hunt, approx. 1.9 miles to 9211 (Lomas), approx. 2 miles to 9217, left approx. half mile to sign. Go to second gate.